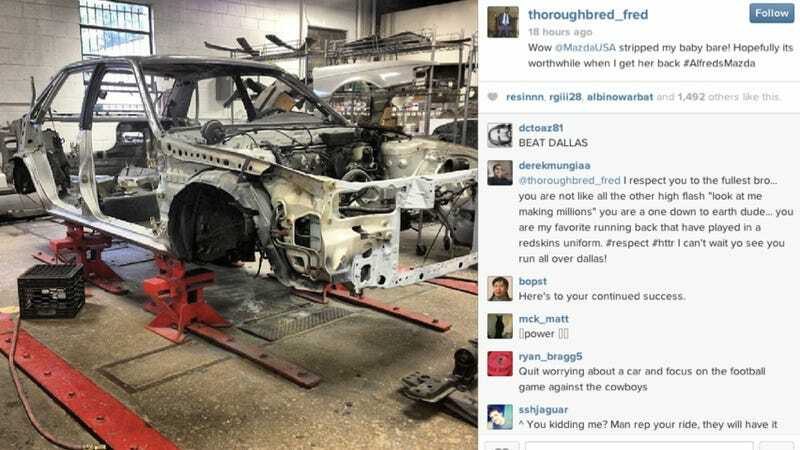 Redskins running back Alfred Morris has a huge contract to play pro-football, but he drives a 1991 Mazda 626. Just a few months ago, Mazda took it in to restore it. And now it's about to be the most perfect 1991 626 on the road. Morris could have used his copious earnings to get a brand new Mercedes or Bentley, but instead, he's gone the responsible route and kept on driving his trust old Mazda. Mazda likes to see their cars being driven, so they offered to fix it up for Morris and bring it back to showroom condition. Right now, it's been totally torn apart, but Alfred seems to have faith. He says he hopes it's worthwhile when he gets it back. He does want his kids to drive it, so he needs the car to be around for a few generations. If I know Mazda, they won't screw it up and it'll be just as much of a joy to drive as it used to be. We'll see what the finished product looks like soon. It'll be the nicest 1991 626 in the world.